Finding possible cousins to chase — particularly, as in this case, cousins in a foreign homeland — is always a joy. Well… here I get to give my favorite answer… it depends. Yes, even this certified and certifiable DNA junkie recognizes that this is only part of the story — and in a case like this isn’t even likely to be much more than a footnote to this story. Because not every genealogical situation needs DNA testing — and not every DNA test can provide an answer to a genealogical research question. And because verifying a biological relationship is only a small piece. So the new cousin I may have discovered — Fritz Georg Geissler — would have been a first cousin to my father, Hugo Hermann Geissler. Neither of whom, I suspect, would be available for testing at this point. My father definitely wouldn’t — he died in 1994.6 And Fritz — son of a man killed in action in 19157 — would be no less than 102 years old if alive today. So we’d likely be looking at the next generation at best: me and my siblings on my side, and Fritz’s children, if any, who’d be our second cousins. Or maybe even their children, who’d be our second cousins once removed. Now… what would DNA testing tell us? And what would it tell us that we don’t already know — or couldn’t find out — through paper trail research? • Mitochondrial DNA (mtDNA) testing wouldn’t tell us anything in this case. That’s the kind of DNA, remember, that we all have but that is passed down only by a female to her children, and then only by the daughters to the grandchildren, and so on.8 MtDNA, then, only looks at the DNA of our direct maternal line — our mother’s mother’s mother’s line. Here, the possible cousins wouldn’t share any mtDNA. My mother’s mother’s mother’s line is straight out of the U.S. southland — Texas to Texas to Alabama — and my new second cousins, if I can find them, would have the mtDNA of their German mother’s mother’s mother’s line. • YDNA testing could confirm that we share a direct paternal line — but only if Fritz or a son of Fritz is available to be tested. YDNA, remember, is the kind of DNA that only men have and that’s passed down from father to son to son in a direct male line.9 So it looks only at the DNA of our direct paternal line — our father’s father’s father’s line. Here, I have the YDNA signature of my father’s line: several of my brothers have tested, including a paternal half-brother, and — whew! — all of them match each other. 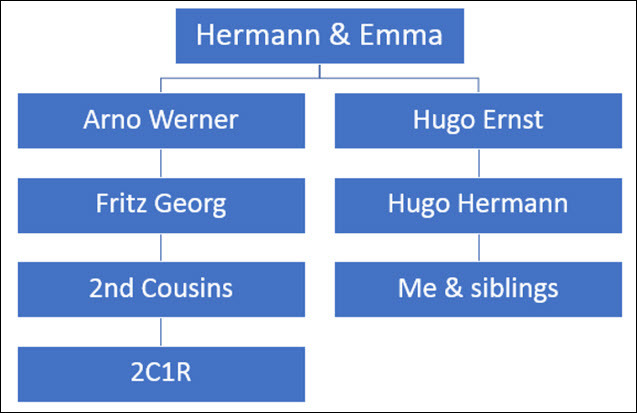 If a male in Fritz’s line is available, we could verify that we all descend from Hermann. But neither of those is particularly what I’d want. The fact is, DNA testing in this case of 20th and 21st century cousins can only confirm what the paper trail should show us anyway: that we share a direct paternal line in the case of YDNA testing or that we share recent common ancestors in the case of autosomal testing. And as a genealogist, as a family historian, as a chaser of personal lore, I want more than that. Realistically, it’s the paper trail here that I really want here: the documents and records and stories that fill out the full picture of a life and not just verifying a biological relationship. I fully understand the value and joy of the DNA match. But it isn’t everything — and in family history, verifying the biology is only a small piece. Aaack! It’s Germany. You know there are restrictions on DNA testing for genetic purposes. Pfft! Not really — only for paternity testing. For genealogy, it’s not a legal barrier. People from Germany keep telling me this is NOT so. The French have a paternity ban. Germany does not, and there are HEAPS of German entries in my YDNA haplogroup project. But after decades of state intrusion, Germans prefer to keep personal information to themselves. And AncestryDNA did not offer their tests there. The other problem is that DNA ethnicity has not had the best database for Germans, so if that is your interest, why bother testing? Hopefully initiatives like LivingDNA’s project to improve a German database for ethnicity might awaken some more interest. Ethnicity estimation would be the last reason why I would test. Finding relatives or confirming common descent would be much higher on my list. Thank you, Judy for once again putting into words what I myself have been having trouble articulating. I think we all need to stop every so often in our enthusiasm for testing and remember that we’re not JUST genetic genealogists; we’re genealogists, period. And that means getting all the facts, on paper as well as in our DNA. Thanks for sharing your thoughts on this Judy. I too love all the new science and have had and continue to have as many relatives as possible test. However, in one of my cousins, confirmed by paper trail and over the years I had to drop the cM’s below 7 to see our matching chromosome. We matched at 6.9 cMs. Since we all know that dropping below 7 isn’t recommended, we might not have found one another if we hadn’t been friends these past 10 years. We actually found one another via our Ancestry trees. So keep on testing, but also keep on researching that paper trail. With one in 10 3rd cousin pairs not sharing enough autosomal DNA to match, and up to half of 4th cousin pairs not sharing enough to match, we’d miss an awful lot of great possibilities if we ONLY focus on DNA, that’s for sure.